The Columbus Blue Jackets travel to PPG Paints Arena to play the Pittsburgh Penguins on Saturday, September 30, 2017. The opening line for this game has the Blue Jackets at +140 and the Penguins at -165. Columbus had a record of 50-24-8 last season and on the road they had a record of 22-12-7. They finished 3rd in the Metropolitan Division. They scored 249 goals and gave up 195 goals for a point differential of +54. For the season they had an ATS record of 51-36-0 and an over/under record of 35-44-0. Pittsburgh finished with a record of 50-21-11 including 31-6-4 at home last season. They were 2nd in the Metropolitan Division. They scored 282 goals and surrendered 234 for a goal differential of +48. Their record against the spread was 66-41-0 while their over/under record was 58-42-0. Zach Werenski accumulated 47 total points last season for the Blue Jackets. He had 11 goals last year with 188 shots on goal giving him a shooting percentage of 6%. He had a total of 36 assists on the season and averaged 20.9 minutes played per game. Artemi Panarin averaged 19.5 minutes of ice time per game last year. In that time he had a shooting percentage of 14% by scoring 30 goals on 210 shots. He had 43 assists giving him a total of 73 points on the season. Sergei Bobrovsky had 41 wins and 17 losses last season in net for the Blue Jackets. He had 1,854 shots against him and he gave up 127 goals. He made 1,727 saves for a save percentage of 93%. Sidney Crosby scored 88 total points last year for the Penguins. He had 43 goals last season with 253 shots on goal giving him a shooting percentage of 17%. He had a total of 45 assists on the season and averaged 19.9 minutes played per game. Evgeni Malkin averaged 18.6 minutes of ice time per game. In that time he had a shooting percentage of 17% by scoring 33 goals on 191 shots. He had 39 assists giving him a total of 72 points on the season. Matthew Murray had 32 wins and 10 losses last year in goal for the Penguins. He had 1,450 shots against him and he surrendered 111 goals. He made 1,339 saves for a save percentage of 92%. The Blue Jackets had 108 total points last season, which ranked them 4th in the NHL. They were 6th in the league in goals scored with 249 while they gave up 195 goals, ranking them 29th overall. They had 211 power play opportunities and scored 42 goals on those chances for a percentage of 20%. That was 12th in the NHL. The Blue Jackets allowed 223 power play opportunities and gave up 39 goals on those chances for a penalty kill percentage of 83%, putting them 9th in the league when short-handed. They averaged 31 shots per game and as a team shot 9.80% for the season. They allowed 30 shots to their opposition per contest and had a team save percentage of 92%. That put them 1st in the league in stopping the puck. The Penguins were 2nd in the NHL with a total of 111 points last year. They had 60 power play goals on 260 opportunities for a percentage of 23%. That ranked them 3rd in the league as a power play unit. They allowed 257 power play opportunities and gave up 52 goals on those chances for a penalty kill percentage of 80%. That was 20th in the NHL. As a team, the Penguins were 1st in the league with 282 goals scored while they gave up 234 goals, which was 14th overall. They averaged 33 shots per contest and had a team shooting percentage of 10.27%. As a team they gave up 33 shots per game and had a save percentage of 91%. That was 10th in the NHL. 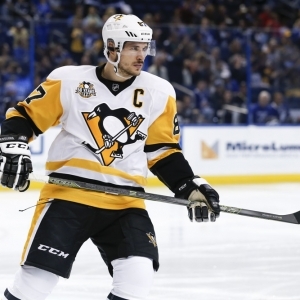 Who will win tonight's Blue Jackets/Penguins NHL game against the spread?